The Milo sofas and chairs from Vale Bridgecraft furniture are made in either high back or low back versions and with a huge range of materials. The legs are as standard a contemporary chrome design, but if you wish we can supply it with a range of wooden legs as well, and even wooden arm facings. The seat and back cushions are all fully reversible so this suite is great for everyday use in the home. As standard with all Vale Bridgecraft each piece of furniture comes with the frame and springs 25 year guarantee direct from the factory. We offer free delivery across mainland England & Wales of all furniture and usual lead time from Vale Bridgecraft is about 6-8 weeks. 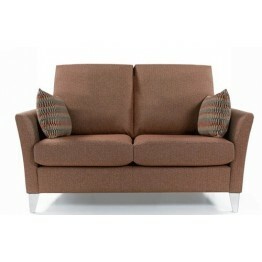 The Milo High Back 2.5 Seater Sofa from Vale Bridgecraft is a contemporary styled settee with 2 reve.. The Milo High Back 3 Seater Sofa from Vale Bridgecraft is a contemporary styled settee with 2 revers.. The Milo High Back chair from Vale Bridgecraft is a contemporary styled chair with reversible seat a.. The Milo High Back Grand Sofa from Vale Bridgecraft is a contemporary styled settee with 3 reversibl.. The Milo Low Back 2.5 seater settee from Vale Bridgecraft is a contemporary styled sofa with reversi.. The Milo Low Back 3 seater settee from Vale Bridgecraft is a contemporary styled sofa with 2 reversi.. The Milo Low Back chair from Vale Bridgecraft is a contemporary styled chair with reversible seat an.. The Milo Low Back grand settee from Vale Bridgecraft is a contemporary styled sofa with 3 reversible..